This summer, Starbucks gives in to your every wish, letting you customize your fave drink, giving it at half off every Monday, and bringing you new and old fave treats to go with it. Plus: scratch cards! Even with all the options now offered at coffee shops, do you ever find yourself still searching for your very own perfect drink? This summer, you just might find your coffee match, as Starbucks Coffee finally lets you be your own barista with However-You-Want-It Frappucino Blended Beverages! With their signature coffee as base, you can personalize your milk option, choose from a variety of syrups and toppings, and select your coffee intensity (extra coffee, espresso shot, decaf?) and how you want your whipped cream! Think: Grande vanilla-mocha with extra mocha drizzle; Tall two pumps caramel, one pump vanilla with extra coffee; Grande nonfat, sugar-free vanilla syrup with decaf coffee. If you don’t drink milk, simply ask the barista to use soy instead. With this option, there are countless drinks you can now enjoy by mixing and matching ingredients. But, there are two drinks that you definitely must try this summer—and which could possibly be your new signature beverage! Beginning today, April 24, up to June 11, 2012, you can enjoy their new Mocha Cookie Crumble Frappuccino Blended Beverage, a yummy twist to your fave Mocha or Java Chip Frappucinos. It has chocolate cookie bits, vanilla syrup, and, get this, chocolate whipped cream—a first for Starbucks! The fluffy choco whipped cream is a delight in itself, as it perfectly balances out the sweetness from the beverage. Why don’t you treat your younger sibling or niece to a cream-based version (read: no coffee!) so you can both enjoy a cool choco indulgence? Aside from its sinful combination of ingredients, there’s another reason you’d want to order this new Frappuccino: For every Mocha Cookie Crumble Frappuccino you buy, you get a scratch card that will instantly grant you an exciting treat you can use on your next purchase of the same drink. You can get a free add-on, free upsize, free double upsize (yes, from tall to venti! ), or buy one, take one on your scratch card, which is valid until June 11 as well. If you’re not really a coffee drinker, you can order the returning classic, Strawberries and Cream Frappuccino Blended Beverage, made with strawberry sauce, whole milk (which can also be non-fat or soy), blended with ice and topped with whipped cream. The best time to sample these However-You-Want-It Frappuccinos is every Monday beginning April 30 up to May 28, from 2PM to 6PM, as Starbucks brings back their Frappuccino Happy Hour! 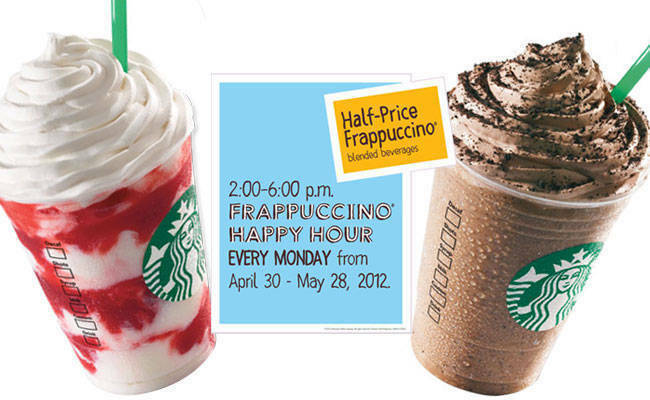 For four hours (not just the original two), you can enjoy However-You-Want-It Frappuccinos at half the price! If you can’t wait ‘til then, you can also avail of their Earth Day promo, where you can get P20 off drinks when you bring your own tumbler—yes, even if it isn’t a Starbucks tumbler--today up to April 28! Speaking of Starbucks tumblers, if you don’t have one yet, now may be a good time to grab one since they have two cool variants you can customize! It’s not just by changing the cover—which you still can do. This time, you can also actually write on your tumbler using a whiteboard marker, dry-erase pen, or permanent marker! (It actually cuts the time you spend ordering: just write your name and order, then hand it straight to the barista!) There’s a Customizable 16.oz (Grande) Cold Cup Tumbler (P550) and a Customizable 16.oz (Grande) Stainless Steel Tumbler (P1,095), which even comes with its own dry-erase marker. Aside from the drinks and tumblers, there are new food treats you can sample with your frappe beginning today up to June 11: the sinful Cookie Crumble Cheesecake With Chips Ahoy (P130); the savory Fish and Chips Wrap (P150); the healthy and filling Chicken Grape Almond Salad on Classic Ciabatta Bread (P150); the Sausage Pizza Roll (P95), which is an improved version of the classic with the use of pizza sauce and frankfurter; and the returning favorite Whoopie Pie (P75), which kids and the young-at-heart will surely enjoy! To see all of Starbucks Coffee’s new offerings, available beginning today up to June 11, and to know more about them, launch the gallery.